San Francisco (Obama.net)- The fact that there is tension in the Middle East is something that cannot be escaped. After many attempts at peace talks, conflict still persists in the region. Now, the situation is tensing even more as Israel is directly addressing Iran. The Jewish Federations of North America held their yearly meeting in New Orleans, Louisiana this week. 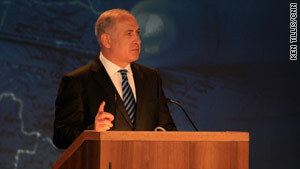 One of the most important guests at the event was Benjamin Netanyahu, the Prime Minister of Israel. The issue of nuclear weapons in Iran is nothing new the United States and the United Nations have both been working to get the Middle Eastern state to disarm for years. However, Iran continues to be defiant and claim that the nuclear programs are for peace and that they should not have to disarm. Netanyahu then told the crowd that Iran is a supporter of terrorism and is threatening to destroy Israel. Netanyahu also said that the Middle Eastern state claims that the Holocaust never happened. The Israeli Prime Minister went on to thank President Obama and his administration’s work to sanction Iran and attempt to force them into disarmament. Netanyahu said that this is the right approach as “containment against Iran won’t work” and force is needed. On the topic of peace talks with Palestine, Netanyahu called for the talks to continue without any conditions. Palestine wants construction stopped in the West Bank and East Jerusalem. Israel has not halted its construction plans despite the talks being delayed because of it. The tensions in the Middle East are not necessarily rising at the moment, but with Netanyahu’s comments on Iran and the delays in peace talks, future problems may occur as patience may begin to run low for all of the parties involved.